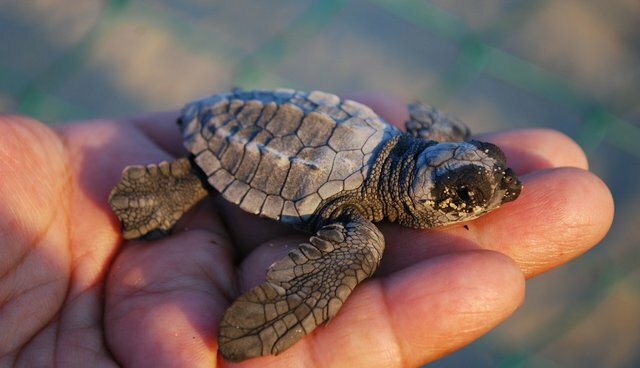 They may be tiny and somewhat clumsy-looking as they make their first adorable little march out to sea, but after that, baby loggerhead turtles have been notoriously hard to keep track of. Up until recently, marine biologists really had very little idea where those hordes of new hatchlings went or what they were up to during the decade between when they disappeared beneath the waves, to the moment they returned to beaches as grown-ups to make nests of their own. But now, thanks to the clever use of technology, researchers are beginning to understand the turtles' mysterious early-lives, a period known as the "lost years". Turtle-tracking devices have been in use for years, they'd always been too big and bulky with batteries to affix to anything other than an adults' shells. To solve this problem, University of Central Florida biologist Kate Mansfield had a (literally) bright idea -- why not use significantly smaller and lighter little solar panels instead? The researcher and her team then attached these sun-powered satellite trackers to 17 juvenile loggerheads and set them loose off the coast of Florida. The animals' journey after that, out towards the massive swirling current known as the North Atlantic Gyre, wasn't what they had theorized. "Based on long-standing hypotheses, we'd expect that the turtles would remain in the outer gyre currents and head toward the Azores" Mansfield told the Scientific American. But instead, the bay turtles were tracked swimming straight into it, likely to forage in the large seaweed patches that collect at its center -- gaining the strength they would need to complete their journey in the vast ocean. Loggerhead turtles are classified as an endangered species, imperilled by a number of factors, including floating plastic debris which they mistake for food. Ocean gyres, including the one in the North Atlantic, are known to trap and collect marine debris, but it is unclear if these latest findings on baby turtles' first migration into it represents a greater threat than previously thought.